A while ago, I was lucky enough to win a $100 voucher in an Instagram competition to be used at Suburban West End. 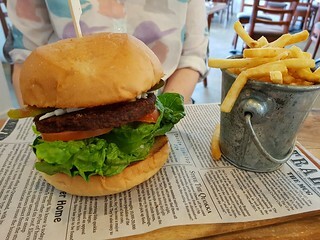 I'd been a couple of times before, and with the release of their new menu I was super excited to try some of the vegan options. I took my friend there for lunch, as a thank you for driving me and holding my hand to get my tetanus vaccination earlier that day. I'm not very brave when it comes to getting needles. We both had soy turmeric lattes (Ashleigh wanted a chai, but apparently the mix contains honey so isn't vegan), which were good and warming and fortifying. Ashleigh got the cheeseburger made vegan, with a Fenn Veef patty and vegan cheese. It also salad, pickles, mustard, and tomato sauce. I tried the Vegan Eggless Omelette, minus the coconut yoghurt, plus avocado. This was good, not too eggy (a plus for me! ), though I wish the cheese inside had been melted. It also had cauliflower, mushrooms, smoked cherry tomatoes, nutritional yeast, and red onions (that I picked out because they were raw and my tummy doesn't like that). The next time I stopped in for lunch, and I was feeling like a burger. I decided to branch out away from the cheeseburger to try the chicken burger. 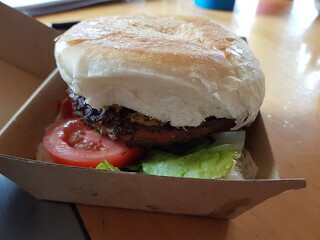 This had a Fenn Chicken Patty (which I really liked, my first time trying), rocket, caramelised onions, and guacamole. It also is meant to come with chili relish, but I had them leave that off. This was a really tasty burger. With chips, of course! 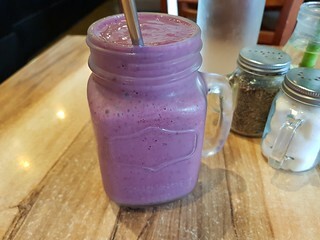 I also had the Blueberry Acai smoothie, which has acai and blueberries (obviously) with banana, vanilla and almond milk. This was perfectly sweet (as in, not too sweet) and creamy and was like having a lovely milkshake. 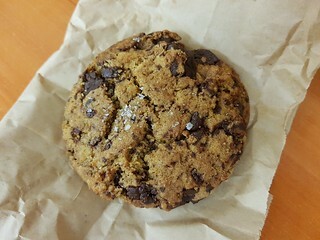 Suburban also has a few vegan baked goodies, but best thing is their salted chocolate chip cookie. I've had this a couple of times and it is so good! My final visit was for breakfast. 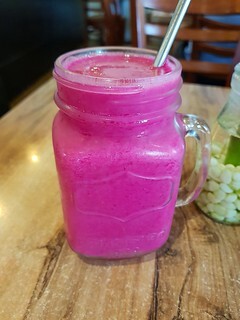 I had just been to a sweaty bikram yoga class, so their Raspberry Pitaya smoothie was in order - raspberry, pitaya, pineapple, and coconut water. Excellent refreshment! To eat I ordered their Beets and Avo on toast... I am a vegan after all. I love avocado on toast, and their version was great. 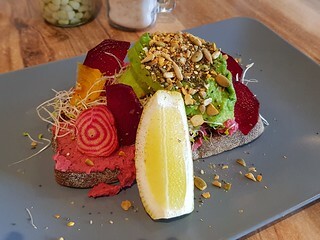 Beetroot hummus, avocado, thinly sliced beets, sprouts, on rye toast. This was light and delicious. I am so grateful that I was able to experience so much delicious food with this voucher, and I am definitely looking forward to going back and trying more things off the menu. I want to try their mushroom toast, their zucchini fritter burger, and the loaded potato scoops from their dinner menu, to name a few. Suburban is a great place if you have a gathering of omnis, but still want to be assured a decent vegan meal. The New Vegan is the second cookbook by Aine Carlin. While it does have a second in the front targeted to give information to new vegans, it is not your typical basic vegan cookbook. It is full of beautiful recipes of all sorts, as well as some great skin care recipes. This post is full of some of the breakfasts found in there, which includes smoothies, juices, and oats. There are a lot of other sorts of breakfasts in there as well, these are just the ones I have made so far. You can also see some of the other things I've blogged from this book here. 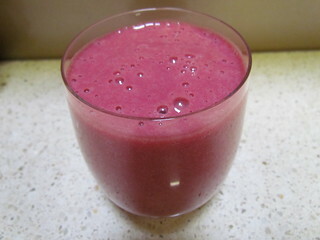 Beetroot and Banana Smoothie: This is so pretty and pink, though tastes more like a sweet milkshake than a smoothie. Banana, cooked beetroot (the vacuum packed kind you get at the supermarket), dates, Maca, and oatmilk. Cashew milk is the recommended, but I always have oat on hand. It is not the most filling starts to the day, I think of this more like a fun snack. 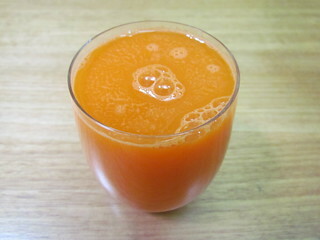 Bugs Bunny Juice: The book has a couple of blender juice recipes. This is a take on one of my favourites - carrot, apple, and ginger. I only used one and a half cups of water, rather than two, and even though there was a lot of pulp and it was quite thick to drain it still was a bit dilute tasting. But I guess that is the side effect of blending with water! Virgin Bloody Mary Juice: I skipped the chili in this, but would have liked to up the tomato. Once again, a but watery tasting. It needed a much strong tomato component. 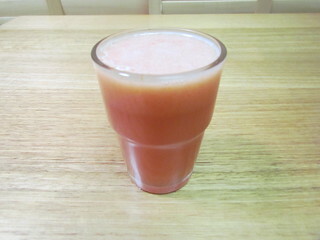 Alternatively, maybe use tomato juice instead of water (leaving out the cherry tomato), and blend the rest into that? This only used 200mL of water, and didn't have much pulp. Coconut, Mango, and Spinach Smoothie Bowl: I made some changes to this, leaving out the coconut oil (eww), using soy yoghurt instead of coconut yoghurt, and leaving out the spirulina or hemp powder. Instead I used LSA mix, and I added a touch of coconut essence to give the coconut flavour. 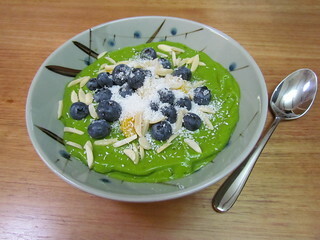 This is green thanks to spinach, and creamy thanks to mango and avocado. I only used half the amount of dates called for, as I don't like things super sweet. This was really thick, thicker than a smoothie, so was a good base to put the toppings on. 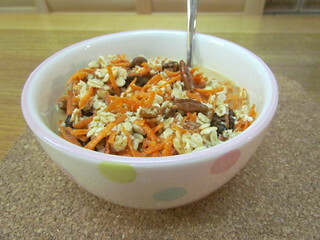 Carrot Cake Oatmeal: Aine uses 25g of oats for a single serve, but that is not a Susan sized single serve. I tripled the amount of oats. This has a blend of grated carrot, spices, orange juice, oat milk, walnuts, and raisins. I found the orange flavour a bit overpowering, so would use a lot less next time. This made one big hearty serve. 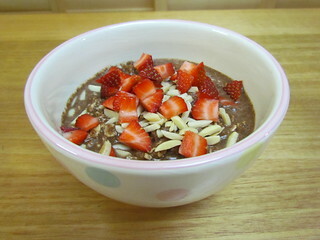 Nutty Chocolate Bowl: This overnight oats bowl looked quite rich, so I doubled rather than tripled the recipe. They only thing I kept the same was the maple syrup, so as not to make it too sweet. I used peanut butter to make a chocolate peanut butter bowl, which was lovely topped with a sliced pear and some chopped hazelnuts. It was very satisfying. 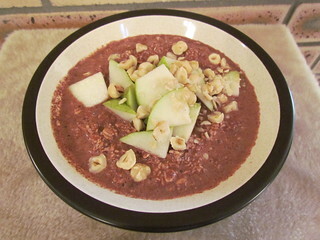 Nutty Chocolate Banana Bowl: This is similar to the above recipe, but with mashed banana in the mix. I did use the full amount of maple syrup for this, and it was a bit sweet. Great topped with fresh strawberries and almonds. Tropical Oats: I wasn't the biggest fan of this one. Oats are soaked overnight, then mixed with a pineapple, lime, and agave puree. For once in my life, I would have liked a bit more sweetener with it, and maybe a bit of coconut extract as well. 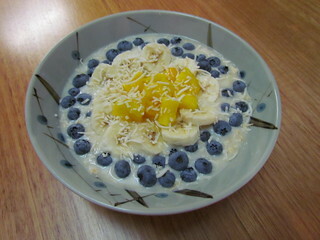 The recipe calls for mango, coconut, and kiwi fruit for toppings, but I used blueberries instead of the kiwi. I doubled this recipe to get enough. 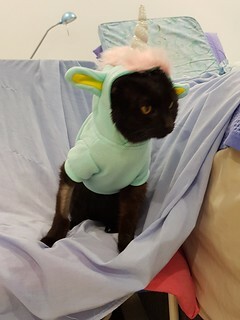 This was Dim Sim's face after I took the unicorn hoodie off her (see the previous few posts for photos of that if you missed it). 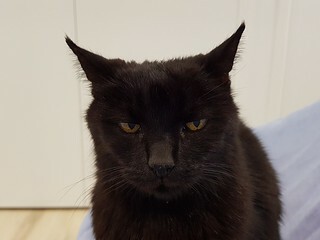 Not impressed! 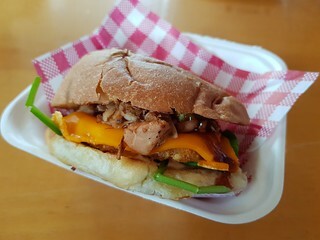 Another month, another Brisbane Vegan Markets. Although billed as Christmas markets, there was very little on theme except for one cupcake stall that had Christmas flavours and decorations. I met my friends Tracee and Jamie there as usual, and we embarked on some eating. 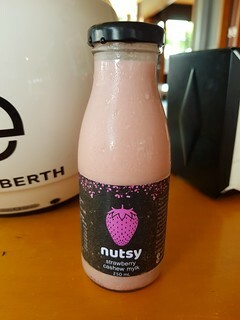 Nutsy was there again with their nut milks, and I was able to score my favourite Strawberry Cashew Milk to start off with. Once again, a lot of the food places were not ready to serve at 9am when the markets opened, so it was good to have this to get started. 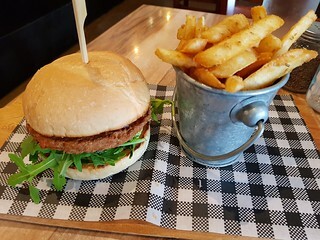 Jamie once again had his favourite Veef Burger from the Farm Animal Rescue stall. He ate two of them last time. This time, I was able to get a photo. I had the Breakfast Burger from Gatherers. 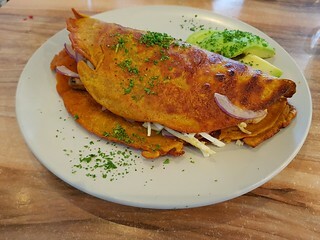 It had a hashbrown, cheese, BBQ jackfruit, avocado, spinach, and tomato relish. It was pretty good, though not too filling. And of course, we finished with some I Should Coco ice cream. 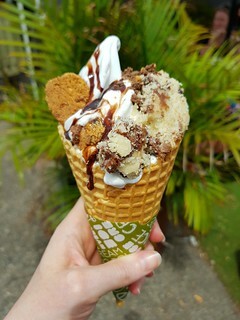 This time I tried the Cookie Monster - chocolate chip cookie dough, chocolate chip cookie chunks, and crumbled vegan Tim Tams with chocolate sauce. 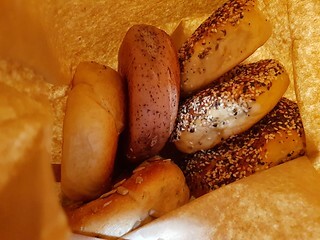 There was a new stall there selling bagels, both filled and also to take away. They had some nice looking fillings, but I just got a selection to take with me. Three everything bagels, one garlic, one rye sunflower, and one blueberry. Unfortunately, I don't remember the name of the place. Also eaten but not pictured, Jamie and Tracee shared some momos, Tracee had a hot dog (though it wasn't very good, sadly), and I also had a sugar cane and ginger juice in my reusable smoothie cup. Before going to the markets, I went to some other community markets where The Little Vegan & Co were having a stall. They make the most amazing baked goods! It was so lovely to be able to meet them, and hear about their very exciting plans for the future. And of course, buy some of their things! 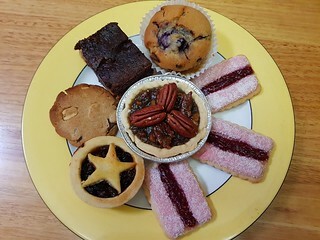 I got a mini pecan pie, a blueberry & chocolate chip muffin, iced vovos, a fruit mince tart, a peanut and chocolate chip cookie, and a peanut butter cookie base brownie. So good. I was super excited about the iced vovos, as I loved them in my pregan days, and they were everything I hoped and dreamed! So that was my final BVM for the year. Next year, we have decided to mix it up a bit and try out different places for brunch instead of just the markets all the time, and just go to the markets every few months. We need a bit of a change and some more variety. Especially as it gets hotter over the next few months! 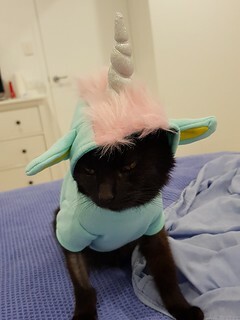 One more photo of Dim Sim as an annoyed unicorn. 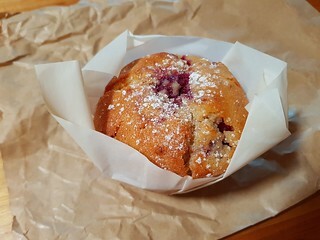 I first heard about Ginger and Rose when my mum sent me an article about the recently opened and very vegan friendly cafe. Then I started seeing it pop up here and there on my Instagram. A quick check of the menu and I knew I had to go and visit. I made a beeline straight for the Strawberry waffles. And they were amazing! 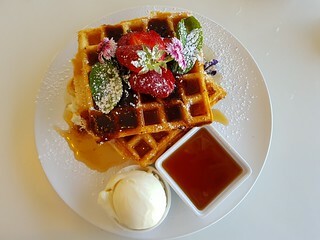 The waffles were crisp and fluffy, with fresh strawberries, strawberry and balsamic sauce, a generous serve of maple syrup, and vanilla ice cream. SOY ICE CREAM! Friends will know what a joy this is to me, who cannot eat coconut ice cream. They have a few different flavours of waffles, all vegan, but of course strawberry always has my heart. 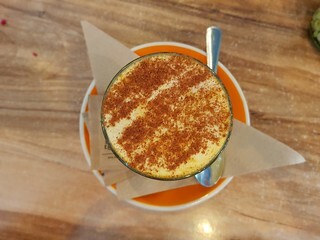 I also had a Banana and Cinnamon smoothie, which was sweet and creamy and delicious. A+ brunch. While normally a breakfast/lunch location, they recently opened on Friday nights for pizza and cheeseboards. I was able to get there the other week to try it out. I was on my own, so limited myself to just one pizza. The cheeseboards look beautiful, though I believe they use Nutsy cheeses. Nutsy is a local vegan cheese company, but unfortunately they have too much coconut oil in them for me. But never mind, because pizza!!!! 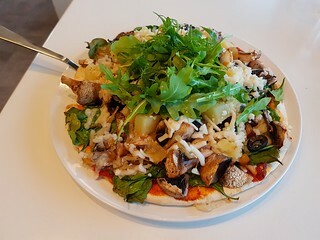 They have a few vegan options, and I chose the Mushrooms vs Onions (it also has spinach on it), but I added pineapple and black olives because I love them. The pizza was loaded! They are not shy of toppings! It did make it pretty messy to eat, the toppings wanted to roll off the pizza when I picked it up, but it was tasty. If the base was a little crispier, the toppings a little smaller, and the cheese a bit more melted I think it would be more cohesive... adhesive? Heh. 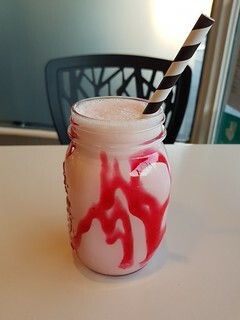 I also enjoyed one of my favourite beverages - the strawberry milkshake. Thanks to them using soy ice cream! 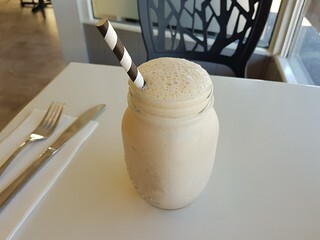 Most places in Brisbane use coconut ice cream in their vegan shakes, which denies me the joy of a strawberry milkshake. So I am so grateful to Ginger and Rose for bucking the trend and sticking with good old soy. Strawberry is the best milkshake flavour! They also have a counter full of baked goods, many of them vegan. 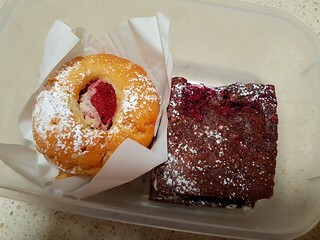 Each visit I have gotten something to take home - a berry muffin, a strawberry muffin, and a raspberry brownie. They also have vegan GF options. And speaking of my GF friends, they now do a vegan GF waffle as well! I'm looking forward to heading back to Ginger and Rose, I'm keen to try their lunch burger, their fritters, and get more waffles! I know you want to see more from that time I made Dim Sim into a unicorn! I am fairly sure that The Joy of Vegan Baking by Colleen Patrick Goudreau was one of the first vegan baking books I ever owned. It is a book I have turned to many times, both for old favourites and for trying new things. A lot of the recipes I made before I started taking photos, so I don't actually have too many on my blog. But I will be remaking them with time. You can see what I have posted before here. 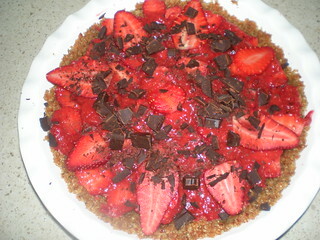 No-Bake Strawberry Pie with Chocolate Chunks: This recipe comes together pretty easily. Using a No-Bake Pecan Crust, you need a lot of strawberries to fill it. Sliced fresh strawberries are layered into the crust, and then topped with a quick strawberry puree mix made on the stove using strawberries, dates, and lemon juice. I found it best to put down half the sliced strawberries, then top with half the puree, then repeat. 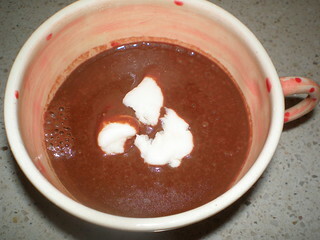 Otherwise the puree tends to just pool and not run down to all the nooks and crannies. 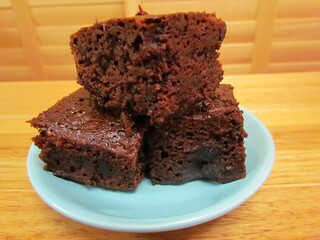 Chocolate Brownies: These are some moist (sorry) fudgy brownies. I baked for almost about hour (rather than 40 minutes as the recipe said), and they were still very moist (sorry). At 40 minutes, they were really not quite cooked. Though to be fair, I know my oven does tend to take a little longer. 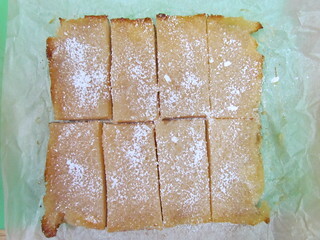 Lemon Bars: I love lemon bars, and these are definitely some of the best. The short crust base is a quite stiff and a bit hard to spread out, but some damp fingers helped to press it out nicely. These are tart and sweet and oh so good. They have silken tofu in them, but you can't taste it at all. My oven needed about an extra 5-10 minutes for each baking step. Make these! 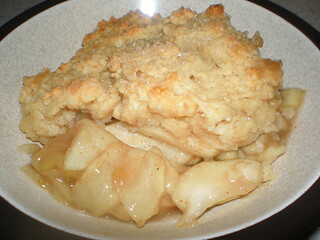 Apple Cobbler: I prefer crumble, but cobbler is always fun. 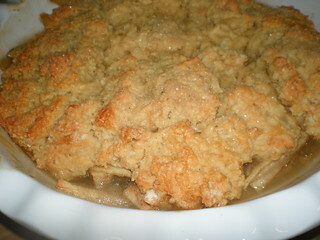 Plus it is kind of like having pie without having to make a pie crust! Tart apples and cinnamon are under a flaky dough. Again, my oven needed an extra 10 minutes to cook the dough through all the way. Great with ice cream. Hot Chocolate: A warming mug of hot, melted chocolate and nondairy milk, what is not to enjoy? Topped with some Dandies that had dried out a little. 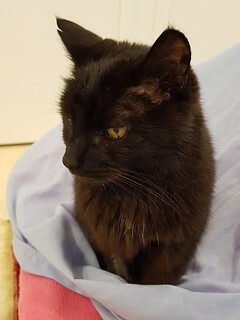 So, I'm that sort of cat mother now. 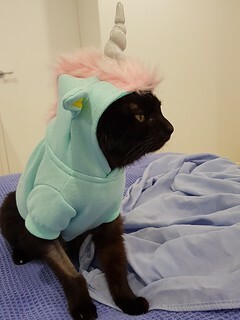 $7 for a unicorn hoodie at Kmart and I couldn't resist. She was less than impressed. She wore it for a few minutes while I took photos, and then I took it off. I don't think I can put it on her again, but geez it was adorable!